What follows is the crystallisation of a few thoughts prompted by a recent Guardian article on what it perceives to be a crisis in the Church of England and how it is being taken over by a dastardly sect called evangelicals. This was followed up with a few conversations in various places on similar topics. The thing that often frustrates me is that when Anglicans use the term ‘evangelical’ they often mean something rather different than when evangelicals use it. When one word is used to denote (or connote) different things, then a mutual lack of understanding can often, needlessly, ensue and can result in hostile, or otherwise unhealthy attitudes between members of the same faith. If one claims that evangelicalism is a “wing” of the Church of England, that’s a misleading statement. Evangelicalism is a far broader, richer, more varied church that can be contained within any denomination (even the largest of them). Rather than try to re-tread well-trodden ground to state who is and who is not evangelical, I attempted to demonstrate that the question wasn’t quite that simple via the use of a Venn diagram that I put together during the last 10 minutes of my lunch break. The point in the diagram was not to highlight differences or to show “why I am not like you” or anything like that. It was rather the opposite. It was to celebrate the breadth and diversity of different expressions of christian identity. It was also to counter some of the overly-narrow focus that some expressions have of themselves, placing them in a broader context. It wasn’t meant to be a complete or accurate representation of all expressions of christianity, merely an improvement to that offered by The Guardian (which in turn, echoed a sentiment I come across frequently, particularly among those who have a phobia of evangelicals). If one were so inclined, you could find at least a dozen things to take umbrage with, and indeed some chose to deliberately miss the point by doing so. To give example of a kind of unhealthy attitude referred to above, take someone who is indoctrinated to think that a church must be liturgical in order to be whole, fully functioning, etc. The reason it’s unhealthy is because it gives rise to ecclesiastical snobbery and a hatred towards to the more ecclesiastically liberal churches that can have a well-rounded theology, with healthy worship that have no need of liturgy. Indeed just the other day I read a comment that expressed a fear of any involvement of evangelicalism within that person’s denomination, describing it as “theologically impoverished”. Such a view is not borne of understanding and love, but of ignorance and hatred. I am not saying that evangelical churches are beyond reproach. There is a time and place for fair, reasoned and loving critique to help build one another up. Even if that sometimes takes the form a rebuke. Yet one must recall “the plank in your own eye” if you find it necessary to speak up about another church/tradition than your own (see here for a recent take on the Evangelical Alliance). Those critiques that carry the most weight come from those that can recognise the weaknesses in their own tradition. It’s fine to pick your particular strand of christian belief, be it Anglican, Baptist, Methodist, etc. but such an identity must be held to lightly, rather than clung on to in white-knuckle defensiveness. One of the other illustrations that I like to use is that of dog breeding. You can have any number of different types of pedigrees and you have cross-bred mongrels. Pedigrees can look beautiful. But the preservation of the purity of their identity comes at the cost of poor health in some. In contrast, mongrels can be ugly things; one can spend time trying to work out the different breeds that have gone into making the dog what it is. Yet for their ugliness, they tend to be healthier dogs. In this (yes, flawed, analogy) I’m a mongrel christian. I find my home in the Ichthus Christian Fellowship, but on the weeks when we don’t get to meet, I will regularly visit other churches. In the last 3 years alone, I’ve been to Assemblies of God, Baptist, Church of England, Congregationalist, FIEC, Methodist, New Frontiers, Pioneer, Redeemed Christian Church of God, URC and other independent churches. There are several attitudes one could take when visiting another church. One could go with a kind of sneering snobbery that seeks to see how they “do things wrong”, determined to see the bad and to leave with a smug sense of superiority about one’s own church. I much prefer to think of it as going to worship with a slightly more distant relative and seeing what good things they do that my home church doesn’t. I’d encourage you to visit churches outside of your normal experience every once in a while. It’s possible you may find something very weird, compared to your regular worship experience, whether that be being asked to kneel in front of someone dressed in robes or seeing someone wave a flag. If you decide to not go back, preferring the ways you are familiar with, that’s OK. But at least if you go and engage with others, then you can come away having shared fellowship with a wider circle of christians than you otherwise might, and you get to experience a different part of the christian life first hand, rather than rely on 2nd hand accounts and scare stories. Some choose to see different denominations as signs of division within the church. But try seeing it as a sign of diversity instead. Then sample that diversity. If your diet consists of knowing the nuance between different types of potato, then you’re not really having a varied diet. Likewise with churches. To taste and see just how good the Lord is, it helps to sample from a different dish every now and then. Q: What does the law of God require of us? There’s really very little that I can say about this, other than “I agree” in a variety of different ways. Having done quite a bit of reading on the ‘new perspective’, I have changed my view somewhat on the nature of the law, which I sketched in part 3. But the law as it stands is best summarised as stated above. Love is a tricky word in the English language, as it doesn’t always convey quite the senses that can be carried by the words in Hebrew, Aramaic or Greek. In the quote above, the Greek word is Agapeo. The concordance I have describes it as “in the N[ew] T[estament] usually the active love of God for his Son and his people, and the active love his people are to have for God, each other and even enemies.” The idea seems to be that it is a very practical action; love is not merely some sort of fuzzy feeling. It’s not affection or fondness. Though that doesn’t mean it is devoid of emotion (see below). What are we to love God with? The list nature as it appears strikes me as a piece of rhetoric which seems to say “everything”, only in a more poetic way. If we can provide love, hands-on, with all that we have, then we are getting somewhere close to what was intended. Yet the list of ways does prompt another thought: that people who have different personalities love in different ways. For example, I am not a particularly emotional sort of person. Even though I tend to go to fairly charismatic churches, which are generally known for a higher than average level of emotional engagement, I remain much more of a thinker than anything else. So one might well say I love with my mind more than anything else. Tendencies to love in one way or another may attract people to certain kinds of churches. So those who have a more emotional reaction may lean towards the charismatic churches. In my experience, Anglicans tend to be better than most at loving with all their strength. i.e. very practically, as are the Salvation Army. In a similar vein, of the Quakers I have come across, they are always very thoughtful and are amongst the deepest thinkers I know; they embody very well the idea of loving God with all your mind. I try to learn from each of these not only to embody such love in myself but to encourage those in the church around me (both a local community and the digital community) to do likewise. The other thing I might point out is the phrase “hang on”. The Greek word which appears in Matthew is kremannymi, a word which doesn’t come up very often in the new testament. When it does, it appears to have the same connotations as we have in our modern English. For example, in Acts 28:4, it describes a snake hanging off Paul’s hand after it bit him in Malta. What it does not seem to say is that “These two commandments encapsulate the law and the prophets.” So these are the foundation of a Judeo-christian ethic. How we live in this world is a complicated matter, living in different climates, cultures, political and economic systems, but if you peel back any individual or any community behaviour within that, we can ask, does it meet these two criteria? Yet in this personal catechism, recall that I haven’t really defined God. I’m not convinced that trying to fit God into a neat little pigeonhole so it can be examined really works. So for now the commandment stands as an instruction to love something we don’t quite know or understand. Yet if we love our neighbours as ourselves, is that really so very different? If our neighbours ultimately encapsulate all those who live around us, then I have several million neighbours within a 10 mile radius. Can I possibly understand each of them individually or even as a collective? Of course, the two cases aren’t identical. I hope you get the general gist of the point. I must admit that I am troubled at times by the phrase “as thyself”. What if someone has lost any and all self-respect, having replaced it with self-loathing? There is an implicit assumption that people will want to live to act in their own self-interests, therefore it is good and proper to act in the interests of others. If the first part is true, then there may be a case for arguing capitalism; it would certainly be indicative of an insight into an element of human nature that spans cultures and time. Or maybe it was an assumption that is commonly true but not universally. If so, what if a person hates themself tries to love others as they love themselves? Does it not then become a command to hate others? I know this is thinking at the extreme edge of some circumstances, but I think christianity should stretch far enough to be able to encapsulate such extremes. To say it another way, if we are to reflect God to the world, then if our love does not extend to its most extreme ends, does that mean that those who inhabit those spaces are beyond God’s love? To this, I would answer ‘no’, though that is a kind of love which is easier said than done. To fully grasp what this kind of love is, is to look up a great mountain. You might climb for several hours, seemingly nearing the top, only to come over a ridge and see before you an even greater peak in an even more inhospitable climate. But who ever said love was easy? Looking around the world today, there are a myriad of different churches, run in all sorts of different ways. If anything, different church structures are the boundary lines that delimit many denominations; certainly far more than any theological differences. Indeed, if you take a random sample of church websites and compare their statement of beliefs, you would be very hard pressed to determine what denomination they are based on that alone. Some churches, such as the CofE are extremely large and do try to ensure uniformity across their individual congregations. Many other churches are not so stringent, opting more for membership of parachurch organisations. Those I have been involved with, at one time or another and to a greater or lesser extent, include the Fellowship of Independent Evangelical Churches (FIEC), Fusion, Youth For Christ, Youth With A Mission, The Icthus Fellowship and New Frontiers. All of these have different structures to them. But is any one of them right? Is any of them outright wrong? I would say the answer is ‘no’ to both questions. Some may be questionable in the sense that there ought to be questions asked about whether the existing structure is totally appropriate for the individual churches’ needs, but I think it unwise for any one to think that theirs is superior to any other. I despair over the rows about women in leadership. The argument against is mainly based on 1 Tim 2 when stripped of all historical context and read as a stand-alone normative instruction. I consider this view to either represent a lack of nuanced thinking on the issue or an excuse by which to preserve and enforce a pre-existing prejudice. Yet the problem the anglican communion faces is trying to preserve unity whilst satisfying those who stand on opposite sides of the divide. Yet it seems to me that ideologically the church has already split, in spite of whatever pronouncements come from the upper echelons of command and the fact that the Synod has yet to vote on it. As a relative outsider to the denomination, all I see is the public face of anglicanism; in other words, I see what the public sees, besides what goes on behind closed doors. Of all the characteristics that could be used to describe this public face, love is not among the first words that come to mind. Schisms are painful and can cause a lot of hurt to individuals. My parents were part of an anglican church many years ago where a small group of people challenged the status quo within that congregation and were consequently kicked out. Even when my parents went back to that same church 40 years later, when nobody was left who was present at the time, the schism was still talked about with some bitterness. Yet the group that left established the New Frontiers and Kingdom Faith churches, both of which have borne much fruit! Of course, my own words may be read as equally unloving and that I may be guilty of spotting a speck in my sibling’s eye whilst the ignoring the plank in mine. This is not meant as a statement of condemnation, but as a prod to hopefully make you think. It’s not my intention to unnecessarily offend, so please don’t take this the wrong way! All of the evidence presented can be interpreted in a number of different ways. I have attempted to give my interpretation, based on my understanding as it stands. There are other interpretations, some of which I have very roughly sketched, but there probably more which I have not given due consideration to here. It seems to me that when we consider the models that have worked, and one which hasn’t, the key to keeping a church well-structured is to allow that structure to be organic in style. The church is made up of people, living in many different circumstances, in multiple cultures, across the world. The church is a) made up of people, b) meant to serve both those inside and the church and c) meant to be the “bride of Christ” whatever we mean by that bizarre phrase. Beyond that, I don’t think it’s wise to be too strict on what shape this ought to take. To stick to traditionalist forms risks making churches anachronistic and out of touch. In a rigid hierarchy, the tendency towards thinking in terms of power instead of service becomes all the more prevalent. There is also the risk that church structure then starts to reflect class structure, with the top level (bishops, archbishops, popes) being the aristocracy, the other church leaders as the middle class and with the “laity” being the working class. That is not to say that churches ought to be without structure. That flies in the face of both scripture and good sense. Rather, there needs to be a recognition of what church ought to be and what it is there for, with the structure then being that which exists to support, but not direct, the achievement of those goals. This is then highly dependent on the geography, history and culture of any given community. A “one-size-fits-all” model of church will be fraught with problems. What works in inner city London will be very different from what works in rural Norfolk and will again be different from what works in a Brazilian favela. Change for the sake of change is equally as bad an idea as tradition for the sake of tradition. So I wouldn’t advocate any church having a massive sea-change in its organisational structure. That is likely to needlessly upset a lot of people and be more trouble than any gradual change. I also wouldn’t advocate any church sticking rigidly to what it already has, nomatter what. Rather, it seems both biblical and sensible for each and every community to consider what they consider the purpose of the church to be. Talk to others and collate knowledge, experience and understanding. This can then be applied to the individual community to suit the needs of both those inside and outside the church. This will inevitably be different for each community, but this need not result in any great amount of disharmony. Depending on your views on eschatology, and here I betray mine a little, we will all be unified at a later time where there will be no more denominations and we will be able to see clearly, no longer as through a dim glass as we do now. When is an evangelical not an evangelical? Please forgive me for another post which hinges around semantics, but this is something that has been gnawing at me for some considerable time and which was freshly piqued by a couple of comments I’ve seen over the last couple of weeks. What do I mean, and what you interpret when we hear or read the words evangelical, evangelism and evangelise? In my view, there is difference between what I mean and what most people here is growing into an unbridgeable gulf, which then makes me wonder whether it’s worth trying to redress the issue or simply to move on and not use the terms any more. When I use the term evangelise what I mean is pedagogical exposition. There are many ways in which this may happen which is why I don’t think it’s appropriate to regard it as a denomination in and of itself. So, even though I went to a wide variety of churches as a teenager, from Baptist, Charismatic, Pentecostal, Methodist, Anglican, Presbyterian, etc. they were all evangelical. Yet there was also the time when Jesus sent out the 12, which is told most extensively in Matthew 10, but which has shorter parallels in Mark 6 & Luke 9. Here, they were simply told to “proclaim the good news” – interestingly they were to travel from town to town and stay in people’s houses. Here, I think some cultural context is called for, as staying in other people’s houses was, I understand, more common in the culture of that time and place than it is in 21st century England. Nonetheless, they were engaging with people on a personal level. In Acts 8, Philip just went to Samaria and “proclaimed the Messiah to them.” It seems that he was in a crowd when he did for we are informed that a crowd was listening to him. We aren’t told explicitly where this took place, but chapter 13 of Acts gives us a strong hint: the synagogue. Again, in Acts 17, we have Paul who went to the synagogue to reason with them (here, the word commonly translated as ‘reasoned’ is dielexato which is derived from the verb dialegomai which has connotations of converse, preach, lecture, argue). So what is the modern equivalent of the synagogue? Is it the church building? I would posit the following: the synagogue was the main meeting place, the hub of the community. It’s where people met in order to listen and to discuss what they heard. It was a social place where the everyday business of living was largely carried out outside of the home or the workplace. That is not to say it wasn’t a place of religious worship, it very clearly was. But it was more than that. So what does that look like today? Society is not particularly uniform; it’s pluralistic, multicultural and many places, disconnected in isolated pockets that may be physically next door to one another. So the modern day equivalent of the synagogue takes many different forms as a consequence; it might be the pub, the coffee shop, the youth club, the gym. It might also be the digital spaces such as the blogosphere, the discussion board, Facebook, Twitter. 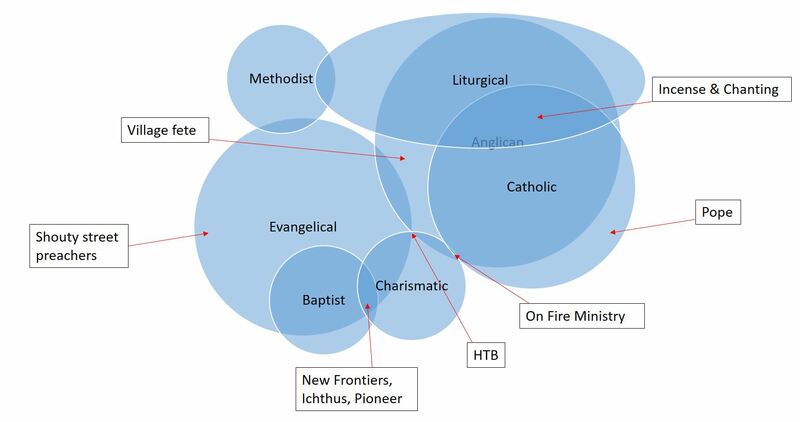 All of these are places where people come together to discuss ideas (amognst other things), and as such I don’t think it too far-fetched to suppose that had the apostles been living in today’s world, these would be the spaces that they choose in which to proclaim their message. To me, evangelism doesn’t mean putting pressure on people or trying to get them to change their whole life in an ‘altar call’ or similar act of coercion. It should in no way resemble browbeating. I can find no biblical precedent for forcing anyone to listen or, worse, forcing them to accept the message. I accept that not everyone will accept the message that evangelists bring, and they are free to reject it. My wish, though, is that they can at least have a fair understanding of what it is that they are rejecting and hence their reasons for doing so may not be based on a lack of understanding or poor reasoning. For example, in some modern parlance, there is talk of christians believing in a bearded sky fairy, which represents a misunderstanding and misrepresentation of the christian faith. Whether that misunderstanding is deliberate, due to a misunderstanding of what they had been told, or whether they have been poorly informed is not always clear. I do not consider evangelical to be a denomination in and of itself. It is a characteristic that runs through many widely varying denominations including those (like myself) who do not define themselves by denomination. It is this identification of evangelicals as fundamentalists that disturbs me. To many, I think, the two are synonymous with one another. The term evangelical conjures up images of a biblical literalist, creationist, afraid of good science, homophobic and often with a strong sense of Zionism (none of which are ideas/attitudes I share). Interestingly, when I once told someone I went to a Pentecostal church, their first reaction was to suppose that my church was “Pro-Israel” when in fact my local church is really quite apolitical, has no official stance and I don’t ever recall contemporary Middle Eastern politics discussed in any church meeting. We’re just busy getting on with the business of being a church. Am I saying these people aren’t evangelical? No. What I am saying is that they have views that are “stuck on” top. It’s a little like taking a picture and gluing on sequins, glitter, string and bits of felt. The add-ons should not be mistaken for the underlying picture. Admittedly, the more add-ons that we have, the harder it may be to see the picture, so it understandable that some misconceptions exist. As I visited quite a variety of churches in my teenage years, learning how others viewed the world, the gospel and the role of the church, I never encountered anyone who was openly opposed to the notion of evangelism. That is, no one in churches. It was only when I went to university that I first encountered a group of conservative, traditionalist Anglicans (who included the college chaplain, who was, and still is, one of the cathedral canons) who thought evangelism had no part to play with christianity. They were very much religionists, whose idea of church was something that happened once a week in an ornate building, where you chant the liturgies, sing some hymns, endure a sermon and go home without thinking about it and without allowing yourself to be challenged. When I asked about the great commission and the history of the early church, their response was that they thought it was meant only for the apostles and had no application for today. So the obvious follow-up is to ask “How do you expect anyone to know the gospel?” The answer, in summary, was that if anyone wanted to know then they should go to the church and ask, or just pick up a bible and read it. While these may be ways by which people find themselves in churches, it absolves the churches of any responsibility to be proactive in educating people. Yet, when I went along to their churches the one thing that was noticeable by its absence was the gospel. The sermons consisted of reading the news headlines and saying “as christians, this is what we should think about these things.” It was always assumed that people knew the basic teachings of christianity, and it’s this assumption (or rather, presumption) that I found rather arrogant and out of touch with the modern world. Where does this leave us? One the one hand, we end up with a skewed vision of evangelism that has crept across the Atlantic and in many cases leaves christians open to (deserved) ridicule. On the other, we could become anti-evangelical and stick to religious ritualism, making it very much an ‘insiders’ club. One compromise that has become more popular over the last 5 years or so is to refer to a church meaning “missional” which essentially keeps the heart of evangelism without the negative right-wing connotations that have accrued around it. However, its use seems just as muddled as evangelical, as it means different things to different people. I view this as needing to be considerate to others whilst at the same time trying to get the message across as clearly as possible. Of course, some people won’t want to even listen. There’s fairly clear instruction on that. It’s not easy to get the balance right and it is often done wrong. So at the one extreme end of evangelism you might have the open air preacher. I don’t care much for this method, as I think it actively detracts from the christian message rather than promotes it. 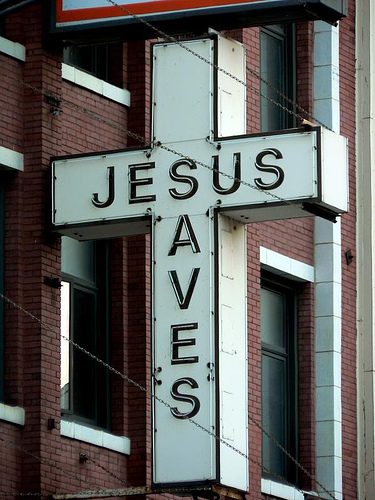 It ensures that people have heard the name Jesus and that he loves you, but little more than that. At the other extreme, you have those who adhere Francis of Assisi’s notion of “Preach the gospel. If necessary, use words” where pedagogical exposition is a matter of last resort, only after someone has somehow grasped the notion of sin and redemption through the historic events crucifixion & resurrection, simply through you being nice to them. As you can tell from my tone, I don’t think either of these are effective means by which to educate people about the gospel. But there isn’t a one-size fits all approach to evangelism. But has the word itself been twisted so far out of its original meaning that it shouldn’t be used any more? I’m not convinced. I think it could still serve a useful purpose, as I am not convinced a suitable replacement has usurped it. Missional may well do the trick, but for now it is too nebulous. After all, if someone is willing to listen to you explain what you mean by ‘evangelism’ they may be willing to listen to some more. This has been a brief overview of some of my thinking as to how we may define a christian. I’ve looked as self-definition, creeds & confessions, the sacraments as boundaries and a cocktail of beliefs. Hopefully, if you’ve had the patience to read it all, you will have realised that I don’t have a definitive version of what defines a christian and what doesn’t. All I have done is looked at some of the ways in which christians have been defined and shown how they fall short of making a clear demarcation. What that leaves us with is a grey area, and quite a large one at that. Does that mean that there isn’t a definition? No; I don’t think so. Most importantly, I don’t think it is the job of any individual or any organisation to make a determination of who is and who isn’t a christian. The writer to the Hebrews said “the word of God is living and active, sharper than any two-edged sword, piercing until it divides soul from spirit, joints from marrow; it is also able to judge the thoughts and intentions of the heart. And before him no creature is hidden, but all are naked and laid bare to the eyes of the one to whom we must render account.” (Hebrews 4: 12,13). I’d rather let God decide. It’s a far better judge than I am. Each of the factors discussed in the parts of this series is, I think, a strong indicator, but any one of them alone is not sufficient to be able to tell apart who is a christian and who isn’t. Throughout this, I tried where possible (and probably failed) to distinguish between being discerning and being judgemental. We are called to be discerning, but warned against judging others; it’s a fine line to tread and I know I get it wrong on plenty of occasions, just as I see others around me do the same (and yes, I will confess to judging people because they judge others). I think I probably ought to call a halt to it there. So that’s an outline of my muddled thinking. Do you try and define who is and who isn’t a christian? Is it too thorny an issue? Do you think I’m a heretic that should be burned at the stake? To say one is a christian, but to not identify exclusively with one denomination can be like saying that you’re a football fan but refusing to be drawn on which team you support; it’s possible but really quite unusual. You are generally expected to pin your colours firmly to one mast or another. Though I made reference to “my church” there are actually several that I attend, depending on whereabouts in the country I find myself on a Sunday morning. Of those that I attend, the one unifying theme is that they have a culture of “come as you are.” They could all be described as a “jeans and t-shirt” church where all are welcome and no one is elevated above anyone else by use of an elaborate garb. I will admit to feeling less comfortable in Anglican churches. There are a few reasons for this: I sketched my thoughts on high Anglican worship recently, so I won’t cover that again. My other objection, and here I use Anglicanism as an example, though the objection extends elsewhere, is that it has become a hierarchical organisation. [I ought to note, for honesty’s sake that I started to ramble at this point, but have cut much out and will save for a later post on why I am not a fan of hierarchical organisation as a substitute for church]. Then we have the problematic issue of Roman Catholicism, which I will come onto shortly. As I see it, the differences between most denominations are barely skin deep. It might be fairest to describe such differences really as issues of emphasis rather than of fundamentally different beliefs. I find it helpful to think of a picture that has some sort of computer editing going on. One denomination may emphasise the blue hues of a picture, another may emphasise the reds. Nonetheless, they are looking at the same picture, with the same lines and forms, though to an outside observer, they may note the slight differences without spotting the overwhelming similarities. But what about denominations that take things away from the gospel that others would consider essential? I think of the Jehovah’s Witnesses and the Unitarians, neither of whom recognise Jesus as being equal with God. In this respect, their theology is far more like that of the Ebionites, who considered Jesus to be fully man, and a good man, great teacher, etc. but without acknowledging him as being one with God. Are they christians, or a quasi-christian cult? Then what about Mormons? With their additional book by Joseph Smith, have they added to the gospel, and maybe in so doing taken something out of it? I find it quite interesting actually to compare the origins of Mormonism with that of Islam, with the author of their key books claiming it was given to them by an angel. I can’t help but think Joseph Smith nicked the idea somewhat. The truth is, I’m not really sure how to write about this subject. I merely think that the issue needs raising and perhaps one of you, who I am sure is a better writer than I, can take it up. To my mind, there is something of a sliding scale with no real demarcations between denominations, cults and heretics. A battle I constantly face is one of balance between judgement and discernment; a battle that I don’t think I always get on the right side of. On the one side, christians have the famous instruction: “Judge not, lest ye be judged,” whilst at the same time the books of the New Testament are littered with calls to be discerning and to avoid false teachers. In general, I am in favour of what is known as the “ecumenical movement” (cue mental images of Father Jack! ), which is a fancy way of saying “have lots of different churches work together.” But I do sometimes question whether in a search for unity, that sometimes there may be a danger of accepting something which is false. At one extreme, you may abandon discernment and accept all & sundry; whilst at the other, you may exclude just about all apart from the Baptist chapel across the road. I have seen both extreme ends of this in practice. On the subject of heresies, I would heartily recommend two books I have read recently on the topic: My review of Bart Ehrman’s Lost Christianities may be found here and a review of Alister McGrath’s Heresy is here. One thing McGrath helpfully describes in his book is that such groups just about always arise from within the ‘mainstream’ church (however you define that: though that may be a significant part of the problem). When I talk of cults, the most obvious examples I have in mind are the cults of Jim Jones or the Branch Davidian cult of Waco fame. But then there are other groups, which may not be as well known about, that share similar characteristics. One that I have come across, and after prayerful consideration decided it would be best to not have anything to do with, call themselves The New Mystics. This group is quite different in structure from some other cults in that they do not isolate themselves off from the world. Nonetheless, they would claim to be christians and openly preach ‘a’ gospel. What they declare though is very often cherry-picked (though if I’m honest, I’m sure most christians, and non-christians too, have done this at one time or another to try to back up their point). The key feature of the New Mystics is that they are a group of “experientialists.” In other words, there is no place for truth in their teaching apart from the truth of what you feel; it’s all about “experiencing God.” It is noticeable that many of their key figureheads (the most notable being John Crowder) is that they are former drug addicts, and as such their whole worldview is based around the language and imagery of drugs. Don’t get me wrong, I am not knocking cultural adaptation. Jesus himself was great at using the everyday examples he had around him as communication tools with his followers. But when the symbolism is used as substitute for the thing which it is meant to represent, you are on deeply dangerous territory. In this respect, I think the New Mystics have much in common with the Roman Catholic take on communion. The observant among you will notice that in much of what I say and write, I will often draw a distinction between what I would call christians and Roman Catholics. This may be seen as antagonistic, though it is never meant to be. I know quite a few catholics who are christian, but even they recognise that the two are not synonymous. The issue here is not of taking things away from the gospel per se, but rather the “add-ons” which detract from the gospel. I won’t go into detail here, but to summarise the things I am uncomfortable with in Catholicism include (but are not limited to): papal status, absolution by priests, forbidding of marriage, mass, saint worship and the over-emphasis on Mary. As noted by McGrath in his book on Heresy, when Martin Luther nailed his 95 theses to the door of a church in Germany, an act which ultimately resulted in the Reformation, he was considered be a heretic by the catholic church. However, he successfully rebutted the accusations and demonstrated that the ideas of the reformation were not new, but were rather a partial restoration of the early church model. At this point, history should record that Catholicism join the list of heresies that has been rejected by mainstream christianity throughout the centuries, placing it alongside Docetism, Pelagianism, Valentinism, Ebionitism, Arianism, etc. It is just a curious feature that the organisation as retained adherents and survived to this day. I know that’s not a particularly popular view, but it is the truth as I see it. But does this mean that adherents to such views are not christians? No. That’s not what I’m saying. While I believe them to be mistaken, I am not in favour of the “excommunication” route. As christians, we do make mistakes and get the wrong end of the stick, just like anyone else. But what is so amazing is that we are given the freedom and grace to make such mistakes. Holding incorrect views doesn’t nullify salvation. I believe the church should be open to all, and that any such views which may cause division or misunderstanding only become an issue when it comes to what the church teaches. So where does that leave us in our search for how define a christian? Well, I’ll wrap up in a concluding post (which should hopefully be shorter than this one) soon.